From the shelling of the fort at Westerplatte, on the Polish coast, on 1 September 1939, to the loss of thousands of German refugees at sea in May 1945, the Baltic witnessed continuous and ferocious fighting throughout World War II. 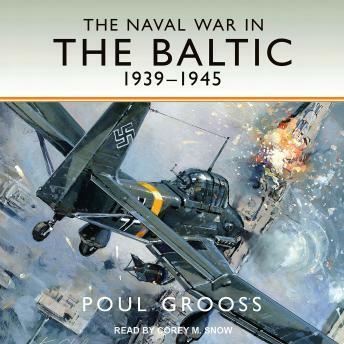 In this new book Poul Grooss chronicles naval warfare in the region and covers such major events as the siege of Leningrad, the Soviet campaign against Sweden in 1942, the three wars in Finland 1939-44, the Soviet liberation of the Baltic states, and the German evacuation of two million people from the East, and the Soviet race westwards in 1945. Grooss also explores topics such as Swedish cooperation with Germany, the Germans' use of the Baltic to train U-boats crews for the battle of the Atlantic, the secret weapons trials in the remote area of Peenmünde, and the RAF mining campaign that reduced the threat of new and revolutionary German submarine technology. He explains how messages from Bletchley Park were the basis for the RAF attacks on German coastal regions. Moreover, Grooss provides the political and military context of the war in this theater and he describes details of ships, radar, artillery, mines, and aircraft.